Phrases like "ruling-class theory", "ruling-class view of reality", "ruling-class ideology" (etc.) used at this site (in connection with Traditional Philosophy and DM) aren't meant to imply that all or even most members of various ruling-classes actually invented these ways of thinking or of seeing the world (although some of them did -- for example, Heraclitus, Plato, Cicero and Marcus Aurelius). They are intended to highlight theories (or "ruling ideas") that are conducive to, or which rationalise the interests of the various ruling-classes history has inflicted on humanity, whoever invents them. Up until recently, this dogmatic approach to knowledge had almost invariably been promoted by thinkers who either relied on ruling-class patronage, or who, in one capacity or another helped run the system for the elite. However, this will become the central topic of Parts Two and Three of Essay Twelve (when they are published); until then, the reader is directed here, here, and here for more details. Dialecticians do not like to be contradicted, which is odd really in view of the way they fetishise 'contradictions', arguing that change can only come about by means of them. Nevertheless, contradict them we must if we are to rescue revolutionary socialism from the clutches of the mystical theory that holds the vast majority of its acolytes in its thrall. In a recent debate at the Socialist Unity blog, I had the temerity to challenge a few of the sacred mantras intoned by this Hermetic cult, and paid the price for my sacrilege by being roundly abused as a nonentity, an "obsessive" and a "ridiculous" figure by fellow comrades. If these accusations are true, one wonders what names we should reserve for those who think that "contradictions" (i.e., arguments between at least two people) rule the universe(! ), and who, while they tell us that truth is tested in practice, belong to a movement that is synonymous with defeat, set-back and long-term failure. Perhaps "deluded idiots"? Or maybe "self-important martinets?" Well, others can throw such names back at these political minnows, I won't. To my mind, being a dialectician is punishment enough, and it would be wrong of me to bad-mouth the afflicted. Is glass a liquid? Goodness me. Firstly, the title of Rosa’s article accuses this blog of censorship. Now, I am amazed that you cannot understand the difference between editorial discretion and censorship. I have neither the means nor the inclination to actually censor Rosa and prevent her putting forward her views. But I wish her to do so elsewhere, because this forum is not the appropriate place -- a very narrow and abstract debate on philosophy was swamping the discussion in the blog, and inhibiting other people from taking part. Indeed I gave Rosa much more space on SU blog than the actual merit of her arguments deserves. It is highly ironic, that one of Rosa’s main argument against dialectics is the alleged (but erroneous) claim that it leads to philosophical categories and processes being adopted regardless of the physical science. Yet here, on the basis of Rosa's philosophy she -- and you -- reject an uncontroversial and mature accepted fact from the physical sciences -- that glass is a liquid. It may be counter-intuitive that glass is a liquid, but it flows. Similarly butter, which Rosa claims is a simple solid is an emulsion, that is it a very complex structure whereby two or more liquids are intermingled at the molecular level. Rosa claims that not all solids exhibit a dramatic state change between liquid and solid phases. She argues this on the basis of the gradual increasing viscosity of butter and glass, when heated. But glass is already a liquid, and butter is a mixture at the molecular level of different substances with differing melting points. This is exactly a case of Rosa imposing her philosophical views upon the physical evidence, and making a false conclusion. Rosa’s attempt to expunge the dialectic also leads to her making an attack on mature scientific theories. I think we have amused ourselves with Rosa for long enough, and I am closing this thread. Moreover, in view of the fact that I had already exposed comrade Newman's 'fibs' about my work, showing him up as both a logical incompetent and way out of his depth in the philosophy of science, it is little wonder he closed that thread. To be sure, the line between damage limitation and censorship is fine indeed, but this fair-minded comrade has managed to straddle both sides of it in one go. Moreover, comrade Newman sometimes devotes space to other 'abstract' topics. Indeed, the site also devotes space to trivia, and yet he can find no space to discuss a theory that is supposed to be integral to Marxism, and is the topic of the thread in question! The difference in this case is that this comrade has met someone who knows what she is talking about, and that might show this fine comrade up to be the bag of hot air his critics (but not I!) have always taken him to be. Unfortunately, the case for the defence has been seriously damaged by his petulance. Yet here, on the basis of Rosa’s philosophy she -- and you -- reject an uncontroversial and mature accepted fact from the physical sciences -- that glass is a liquid. Now, my case against Engels's first 'Law' is not based on whether or not glass is a liquid (as some scientists seem to define it), but on whether its manifest properties (or "qualities") change quickly or slowly when it is heated. But, who does not know that these "qualities" change slowly when glass is heated or cooled? Apparently, only this alleged balloon of dialectical hot air. Of course, butter also slowly alters from hard to soft when it is heated, whether or not it is an emulsion. Does this logically-challenged comrade think otherwise -- that is, does he think that when he takes his Lurpak out of the fridge, he has to put it in a bowl immediately or risk it forming a puddle on the floor of his kitchen? Who can say what precautions he has to take with his instantaneously melting dialectical butter? What "philosophical views" are these, then? And where did this dialectical fabulist find them? Not at my site; not in any of my posts. Comrade Newman does not say, but he apparently knows more about my beliefs than I do, so I am loathe to contradict him. Less deferential comrades might however just begin to suspect he makes stuff up as he goes along -- the Enid Blyton of dialectics? Anyway, the above comment is a bit rich coming from someone who is happy to impose his 'theory' on nature and society in defiance of the facts (see below), and who thinks that metals go from hard to soft suddenly at their melting points, and that glass can be stirred with a spoon at room temperature. I will not tolerate a further bad tempered debate about what Rosa thinks of as philosophy, but to everyone else reads as ramblings from an obsessive. So, opinion is divided on this, but one thing is for certain: glass melts from the 'solid' state to the 'liquid' state slowly, not 'nodally'. Moreover, in view of the fact that comrade Newman has been blogging away, come rain or shine, several times a day (often posting long and invariably well-written and competently researched articles on all manner of subjects) since February 2006, I can take a few lessons from him on obsessive behaviour. Yeah, from now on, I’m going to get all my facts on science from the http://www.zyra.org.uk/ webpage. Why not try http://en.wikipedia.org/wiki/Glass instead? You've really scrapped the bottom of the barrel Andy. Alex, I gave a facetious reference, but my point still stands. There is a serious argument that glass is a liquid based upon its lack of internal molecular order. I have never looked into the question of whether it actually flows or not. The situation at the level of molecular physics can be summarised by saying that there are three main types of molecular arrangement: crystalline solids: molecules are ordered in a regular lattice fluids: molecules are disordered and are not rigidly bound. glasses: molecules are disordered but are rigidly bound. There is no clear answer to the question "Is glass solid or liquid?". In terms of molecular dynamics and thermodynamics it is possible to justify various different views that it is a highly viscous liquid, an amorphous solid, or simply that glass is another state of matter which is neither liquid nor solid. The difference is semantic. In terms of its material properties we can do little better. There is no clear definition of the distinction between solids and highly viscous liquids. All such phases or states of matter are idealisations of real material properties. The argument that it is not a liquid and also not a solid is one I am prepared to accept, and this also refutes Rosa's point whereby she uses Glass as a example of a solid in terms of its transition behaviour to "prove" incorrect remarks by Engels that are accurate for the transition of phase for almost all materials. Glass is indeed an exception that proves the rule, because a detailed study of the transitional properties of glass show that the same arguments apply that explain the more dramatic state transitions of other materials. The fact still stands that Rosa seeks to argue about the physical sciences based upon her philosophical position. The very thought crime that she falsely alleges that her philosophical opponents engage in. I have to say that these theoretical opponents are largely [sic], as Rosa simply doesn't understand many of the theories she polemicises against. There are two very big problems with Rosa's approach. One is that she doesn't seem to understand that debates on blogs and discussions boards are ephemeral, and also that people don't take her or her arguments at all seriously. So there is an asymmetry between the obsessively detailed responses she makes to what are casual conversations. If anyone could be bothered to seriously debate her they would much more seriously research their position, and make much sharper arguments. Secondly, Rosa has a problem with literalism; whereby she puts far too much store on specific technical meanings of words and phrases, without seeing that they may be used outside that formal context; or that they may have more than one meaning. And there is a certain obsessiveness and even anger from her; reading her articles, there is a great deal of superficial erudition combined with inability to understand or empathise with what other people are saying, if they are using words to mean something different from the literal technical meaning that she has decided they mean. As JohnG has pointed out, much of Rosa's argument is simply her claim that she is the only one allowed to define the word "contradiction"; and also a literalism that puts almost fetishistic significance to whether or not working scientists use explicitly Hegelian language. Rosa has no insights. Her superficially wide knowledge of philosophy doesn't mask the fact that she clearly has failed to understand a great deal of it. She is tilting at windmills; and the fact that she has put so many years effort into a futile obsession is sad. In particular Rosa has completely failed to demonstrate any mechanism by which dialectical materialism has played the disastrous role she says it has. As I said before, the fact that people are not prepared to debate with Rosa, doesn't mean that they are unable to do so; but that it isn't worth the effort. Particularly due to the confrontational and obsessive way she debates, her literalism, and her aggression. It now turns out glass neither flows nor is it uncontroversially a liquid. And yet, its "qualities" (hardness, an ability to transfer sheer, etc.) change slowly when heated. Is comrade Newman still going to "impose" his 'theory' on this phenomenon, and deny this particular qualitative change happens slowly? Readers will find several quotations from a wide range of scientific textbooks that support the above conclusions about glass, here. Which only serves to confirm my claim that some "qualitative" changes are nodal, while others are not. So, what he says is plainly not the case. Was I wrong then to say the following in Essay Seven (referring to Hegel, Engels, Plekhanov and Lenin, and their use of the word "leap")? Unfortunately for these dogmatists, many things in nature change qualitatively without passing through such "nodal points" -- and not even so much as a tiny "leap". These include the following: melting or solidifying plastic, metal, rock, sulphur, tar, toffee, sugar, chocolate, wax, butter, cheese, and glass. As these are heated or cooled, they gradually change (from liquid to solid, or vice versa). The answer (according to the above quotations) is "No". Indeed, in relation to metals, comrade Newman might find it hard to find many (who are not dialecticians) who do not know that metals and plastics soften slowly when heated, or that glass slowly changes from the hard form of its liquid/solid/whatever state to the soft form of its liquid/solid/whatever state, too. Moreover, Engels did not know what we now know about glass, and yet he ignored this counter-example. He surely knew it melted slowly! Does then 'solid' glass "leap" from that state to its "liquid" state? If so, glass blowers will be surprised to hear it. Comrade Newman likewise ignores the many other examples of changes in "quality" that are non-nodal -- just as he, like all other DM-fans (and as I predicted), refuses to tell us what he means by "quality" or how long a "node" is supposed to last. Mickey Mouse Science at its best! So, the evidence from nature confirms what I have alleged in Essay Seven: that some changes in "quality" are, and some are not, "nodal". Is this an anti-materialist conclusion? No. Does it disregard all the facts? No. Will comrade Newman admit this? No. Why? Because, like Engels and all other dialecticians, he is keen to "foist" DM onto nature. The fact still stands that Rosa seeks to argue about the physical sciences based upon her philosophical position. The very thought crime that she falsely alleges that her philosophical opponents engage in. I have to say that these theoretical opponents are largely, as Rosa simply doesn't understand many of the theories she polemicises against. No doubt impartial observers will agree with comrade Newman that he is perfectly well placed to make unfounded allegations about my incapacity to understand certain unnamed "theories", he being an expert in the genre (as we have seen in relation to glass). One is that she doesn't seem to understand that debates on blogs and discussions boards are ephemeral, and also that people don't take her or her arguments at all seriously. 2) "People" do not take my arguments seriously. I agree with comrade Newman about 1), but 2) confirms the experience I have had over the last 25 years debating with dialectically-distracted comrades: since they cannot answer my criticisms, they quickly adopt the fall-back position of abusing me, and pretending the points I make are not "serious". This is an understandable defence reaction to the fact that not one of them can defend their core ideas. So there is an asymmetry between the obsessively detailed responses she makes to what are casual conversations. If anyone could be bothered to seriously debate her they would much more seriously research their position, and make much sharper arguments. Readers will note the somewhat obsessive accusation that I am "obsessive"! However, as I pointed out to the comrade at his site, he is the sort of numpty who would have accused Marx of being an "obsessive" anti-capitalist, spending his entire mature life writing, and then authoring three (or four!) volumes of Das Kapital, the length of just one of which easily dwarfs all of my work. Will he now accuse Marx of "obsession" when he spent a whole year of his life writing Herr Vogt, a book that is over 300 pages long? Is Herr Vogt "obsessively detailed"? Indeed, if it is a crime to follow Marx's example, and "obsessively" attack a theory that has helped ruin the movement he founded, then I am happy to plead guilty. If anyone could be bothered to seriously debate her they would much more seriously research their position, and make much sharper arguments. One thing is for certain, had I not gone into such detail, I'd be accused of "superficiality"! Nevertheless, these are brave words for someone who can't even get the basics of logic right, and who belongs to a movement overflowing with comrades who are similarly logically-challenged -- but who still pontificate about the "limitations" of Formal Logic (which claim is shown up to be the fraud it is, here). Brave words, too, from a comrade who, even now, after being challenged to do so, cannot tell us what a 'dialectical contradiction' is, and who still refuses to say what a "quality" is or how long a "node" is supposed to last! "Shaper arguments" my foot! In fact, the useless conceptual tools Hegel bequeathed to this sorry bunch of mystics actually prevents them from defending their ideas against my attacks. Which is just one of the reasons they are so terminally unclear about all of their core ideas. Readers are encouraged to check out what I have said there, where they will soon see that I do not claim that I alone can define the word "contradiction". What I have done is show that Mr G (and by implication comrade Newman) have yet to tell us what they mean by the use of this word, and that what little we have been told so far makes no sense at all. The accusation concerning the use of "Hegelian language" is entirely accurate, however. It is surely of "fetishistic significance" to request of someone who claims that scientists use dialectics in their work (as comrade Newman has done) that they prove it, not least by showing where they do so. [We are still waiting on that one!] Indeed, it would be highly unreasonable of me not to overlook the fact that scientists do not use Hegelian terminology -- which negative fact I now acknowledge can legitimately be used to prove that one and all are orthodox dialecticians! In fact, I shouldn't have ignored this conclusive negative evidence in other respects too: I should have admitted that scientists are all Buddhists, Christian Scientists, Flat Earthers, and Klingons -- for which the available evidence is equally compelling. Secondly, Rosa has a problem with literalism; whereby she puts far too much store on specific technical meanings of words and phrases, without seeing that they may be used outside that formal context; or that they may have more than one meaning. Readers of a more fair-minded disposition might wonder where I have committed this heinous crime, but it is no use looking to comrade Newman for help (for he does not reference these strange allegations). And sure, dialecticians do use words in odd ways, but when they are asked to explain themselves, they either ignore such requests (as this 'erudite' comrade has done -- once more, we have yet to be told what a dialectical "quality" or what a "dialectical contradiction" is, or even how long a "node" is supposed to last), or they become abusive (rather like comrade Newman, and worse). And there is a certain obsessiveness and even anger from her; reading her articles, there is a great deal of superficial erudition combined with inability to understand or empathise with what other people are saying, if they are using words to mean something different from the literal technical meaning that she has decided they mean. The above page contains links to forums on the web where I have 'debated' this creed with other comrades. You will no doubt notice that the vast majority all say the same sorts of things, and most of them pepper their remarks with scatological and abusive language. They all like to make things up, too, about me and my beliefs. 25 years (!!) of this from Dialectical Mystics has meant I now take an aggressive stance with them every time -- I soon learnt back in the 1980s that being pleasant with them (my initial tactic) did not alter their abusive tone, their propensity to fabricate, nor reduce the amount of scatological language they used. In fact, comrade Newman was quite reasonable and pleasant to me last year, but as soon as I appeared one year later (I had in fact given his blog a wide berth for twelve months), he was almost the exact opposite. Had I bad-mouthed him in the intervening months? No. But that did not stop him using abusive language when I posted a rather innocent comment at his site the other day. What of the other things this pleasant comrade says of me? [T]here is a great deal of superficial erudition combined with inability to understand or empathise with what other people are saying, if they are using words to mean something different from the literal technical meaning that she has decided they mean. Although I have endeavoured to construct as comprehensive a case against DM as I am capable of producing, I have also sought to raise objections to my own criticisms at almost every stage. While this strategy has been adopted to test my ideas to the limit, it has also been of some use in trying to make DM comprehensible. To that end, the reader will find that many issues have been raised here for the first time ever. Core DM-theses have been examined in unprecedented detail, most of them from a completely novel angle. It is a sad reflection of the mental paralysis induced in those who -- in Max Eastman's words -- "suffer from dialectics", that such key ideas have escaped detailed attention for over a hundred years, but it is nonetheless accurate for all that. Even if it should turn out that this project is misconceived in some way, it succeeds in breaking entirely new ground, as readers will soon discover. In fact, should DM-supporters engage fairly with the content of this site -- even if they remain of the same opinion by the end --, they will find that their own ideas will emerge strengthened because of the entirely novel challenges advanced in this work. Of course, this is not the case. I have set this out in extensive detail in Essay Nine Parts One and Two. If there is a flaw in my argument, it is no good looking to this 'expert philosopher' for help; you are sure to be labelled an 'obsessive' for your pains. In fact, this is well-known 'dialectic-speak' for: "Oh dear, none of us seem able to answer her criticisms!" To the ever-lengthening list of such sorry comrades I think we can now add comrade Newman's name. 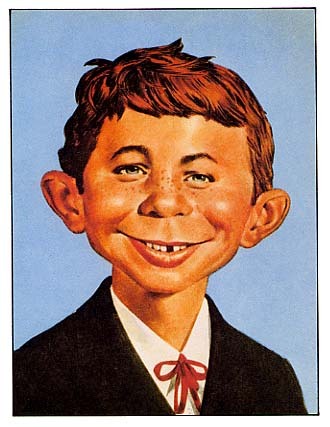 In fact, I rather suspect he has now become the 'Alfred E Newman Of Dialectics'.